This Refurbished HP 8000 Elite boasts all the computer power you need to run your business. The small form factor desktop PC (SFF PC) features an E8400 3.0GHz Core2Duo processor with 4GB memory, enabling you to perform tasks efficiently. Thanks to a 250GB hard drive (HDD), the HP 8000 Elite offers plenty of room to store your all-important data. And, when you purchase your refurbished computer through RefurbThat, you receive Windows 7 HOME pre-installed, which runs the most popular business applications. Plus, enjoy the convenience of a DVD drive and eight USB ports. 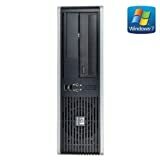 The HP 8000 Elite comes with the RefurbThat 1 Year RTB Hardware Warranty at no extra cost. Intel Core2Duo E8400 3GHz processor; for fantastic performance 4GB DDR3 RAM memory; enhances system efficiency 250GB HDD; safekeeping your valuable files. Eight USB ports; connect all the devices you need. Please Note If your PC is configured with 4GB or more memory we will automatically install 64bit Operating System. Please ensure that any software you subsequently install is compatible with this. This entry was posted in Desktop Computers and tagged 250Gb, 3.0GHz, 8000, Core2Duo, Desktop, DVDRW, E8400, Elite, Home, Intel, Memory, Refurbished, Windows by Computer Education World. Bookmark the permalink.